Painted in 1982, the year of Haring's Soho gallery debut at the Tony Shafrazi Gallery; this compact, vibrant work presents a distillation of his iconic visual vocabulary. Always identified with these early icons with which he made his public debut - the radiant child and the outlined figure are seen here contrapuntally in a tension and antagonism that is memorable and immediately recognizable. 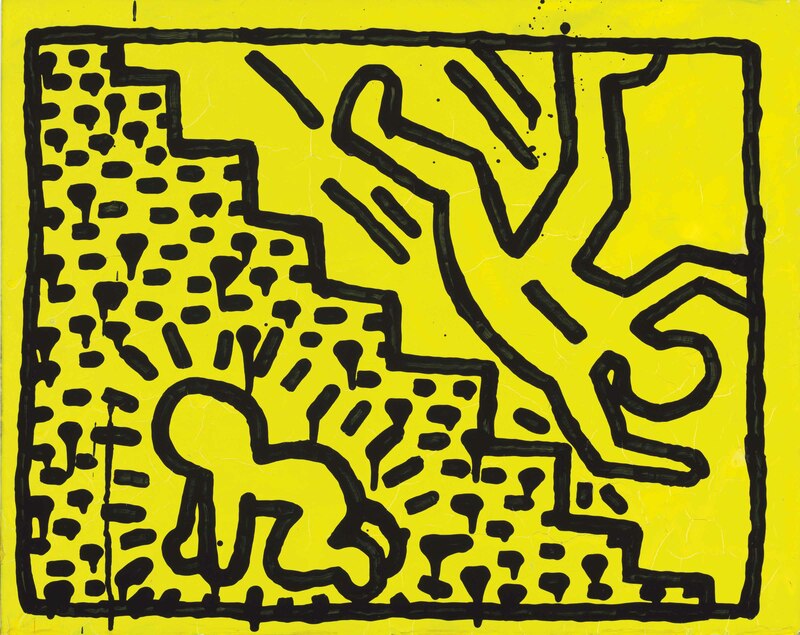 Using dark line and brilliant yellow enamel on panel, Haring clearly sought to startle with his use of arresting color and bold mark-making. The two figures exist in a world, seemingly unaware of one another, divided by a precarious descending stair. The work possesses a dynamic, frenetic energy drawn with intensity: the marks of the paint are staccato-like, and a sense of urgency is revealed in a distinctively typical image with his characteristic patterns of dripping. Keith Haring communicated his experience of the world through his art, and the emotions often associated with his very personal iconography are anxiety and euphoria, power and threat, heaven and hell. These topics do not appear in his work in isolation but rather as overlapping, interacting. It is in this way Haring hoped to communicate at both visceral and intellectual levels simultaneously, allowing us our own interpretation, linking the artist's imagination with our own. It is in this way Haring's work thus becomes - quite simply - elemental.